Indonesian police have named Jakarta’s governor, Basuki Tjahaja Purnama, as a suspect in a blasphemy investigation. 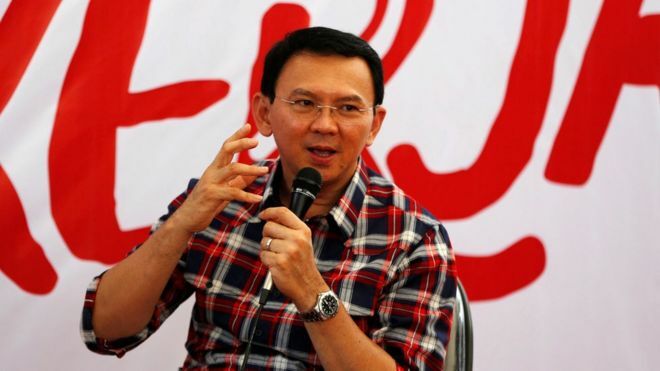 Popularly known as “Ahok”, he is accused of insulting the Koran while campaigning in governorship elections. Mr Purnama is a Christian from the Chinese ethnic minority and the first non-Muslim to lead the city. The case has prompted fears of a rise in tensions in the largely Muslim country. The naming of Mr Purnama as a suspect means prosecutors can bring him to trial. If found guilty he faces up to five years in prison. Police said they would not detain the governor despite calls for his arrest from Islamist groups, but barred him from leaving the country during the investigation. They also recommended that the case be tried in an open court. He has not been barred from the February governorship election, in which he is seeking a second term. In a September speech Mr Purnama said Islamic groups who were using a Koranic verse to discourage support for him were deceiving voters. The verse is interpreted by some as prohibiting Muslims from living under the leadership of a non-Muslim. Islamic groups said he had criticised the Koran and lodged complaints with the police. Mr Purnama later apologised. Earlier this month, at least 100,000 people took part in a protest led by a hardline Muslim group in Jakarta calling for his resignation and prosecution. The movement against Mr Purnama has taken on anti-Chinese overtones. Police said that ahead of the protest there were “provocative statements and images” on social media which called for violent action against Mr Purnama. However, Mr Purnama remains popular for his hardline stance against corruption and reformist policies. He was appointed governor of Jakarta after his predecessor, Joko Widodo, became president. In 1998, a wave of anti-Chinese sentiment led to mobs looting and burning Chinese-owned shops and houses. Ethnic Chinese make up about 1% of Indonesia’s population of 250 million people.